These are growing from the same plant. I call them the multi colored Hydrangea. I love my Hydrangeas. 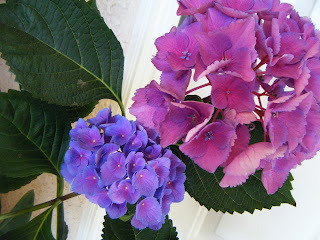 I hope you have enjoyed seeing my Hydrangea. Now let's see if I can get at least one more card done this week. Take care and God bless you. Thanks for stopping by. What gorgeous flowers, Gloria! Love these and the previous post too. One of my favorite flowers...and I've never grown any! Thanks so much for your sweet note. I appreciate it more than you know. I'm always encouraged by your sweetness! Stunning flowers! Thank you for sharing your blooms with us. That is too neat, a bicolored hydrangea!